What are the best design practices when it comes to expanding your outdoor environment? This is a question the design professionals at IVY Studio deal with on a daily basis in their residential outdoor projects. The single most important component is to listen to the goals and aspirations of the client and then come up with a creative and functional design that meets the client’s objectives as well as mesh with their budget, style, home architecture and setting of the land on which the house is situated. We are IVY Studio, a residential landscape design and build consulting firm based in the greater Boston area. 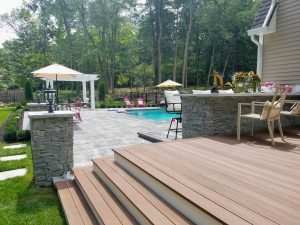 Contact us at 781-591-0300 or vern@ivystudioMA.com to learn firsthand about our planning, designing and implementing strategies designed to follow a clearly marked path with quality that is carved in stone!